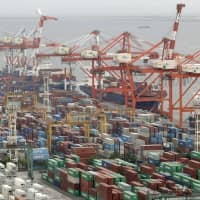 Japan’s goods trade balance fell into the red in fiscal 2018 for the first time in three years amid higher energy prices and sluggish demand from China, government data showed Wednesday. Japan logged a deficit of ¥1.59 trillion ($14.2 billion) in the year through March, according to a preliminary report by the Finance Ministry. Exports rose 1.9 percent from a year earlier to ¥80.71 trillion on increased deliveries of cars and ships, while imports jumped 7.1 percent to ¥82.29 trillion on higher costs of crude oil and liquefied natural gas. 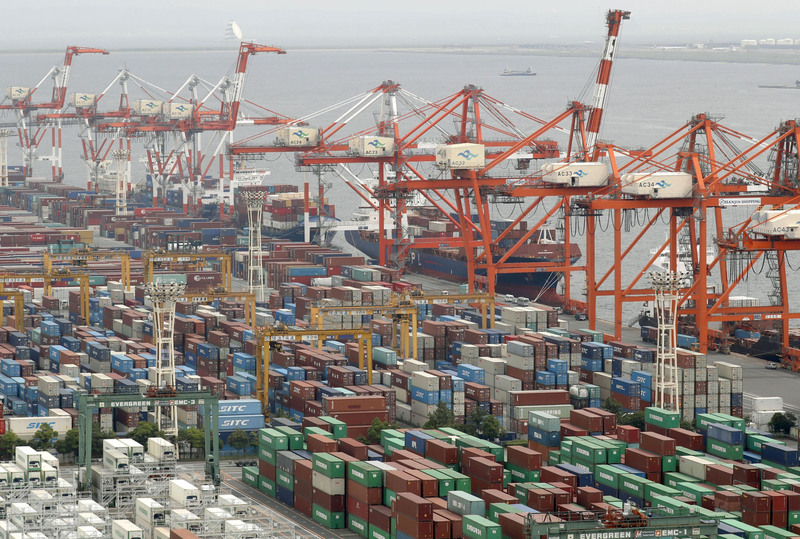 Exports have served as a driving force of the Japanese economy’s recent expansion cycle. But demand has weakened in recent months, with the trade conflict between the United States and China taking its toll, particularly affecting Chinese capital spending. Koya Miyamae, a senior economist at SMBC Nikko Securities Inc., said business investment in China would not expand while tensions continue between the world’s two largest economies. “Exports will likely continue to remain sluggish for the time being, although they may not deteriorate further,” he said. Among trading partners, Japan’s trade surplus with the United States decreased 6.7 percent from a year ago but remained high at ¥6.53 trillion, a level that could prompt U.S. President Donald Trump to put more pressure on Tokyo in his bid to cut his country’s deficits. Japan’s U.S.-bound exports climbed 2.9 percent to ¥15.63 trillion, but by sector, automobiles and auto parts were down 1.3 percent and 3.9 percent, respectively. Analysts pointed out that the declines in auto exports may have reflected the trend of Japanese automakers boosting their production in the United States amid threats from the Trump administration that additional levies would be placed on Japanese car imports. The release of the latest trade data came hours after economic revitalization minister Toshimitsu Motegi and U.S. Trade Representative Robert Lighthizer wrapped up their two-day trade talks in Washington, with the U.S. government regarding a bilateral trade deal as a way to rectify the trade imbalance. Japan’s deficit with China, its biggest trading partner, expanded for the first time in three years to ¥3.58 trillion. Exports grew 2.9 percent while imports rose 3.5 percent. Tokyo’s trade surplus with the rest of Asia, including China, tumbled 14.4 percent to ¥5 trillion, down for the first time in five years. Exports increased by 1.3 percent and imports grew 3.7 percent. With the European Union, Japan incurred a trade deficit of ¥421.7 billion — the seventh straight year the balance has stayed in the red. Imports hit a record-high ¥9.69 trillion. For March alone, Japan had a goods trade surplus of ¥528.5 billion, with exports falling 2.4 percent and imports rising 1.1 percent.